While the Total Visa Unsecured doesn’t require a security deposit, cardholders will be buried in additional program fees. The biggest perk of the Total Visa Unsecured credit card is the low barrier of entry. Applicants with bad to fair credit are encouraged to apply and can find out if they’ve been approved in seconds. If you’ve had trouble getting a credit card application accepted and need to open a card as soon as possible, the Total Visa can be a good option. The initial credit limit for the Total Visa Unsecured is on the lower side, at $225 after your annual fee. Unlike a secured credit card, you won’t be able to increase this limit by paying a bigger deposit up front. The Total Visa Unsecured also doesn’t specify a timeline for reviewing your account for a credit line increase. If you do request an increase and are approved, you’ll also have to pay a 20 percent credit limit increase fee. So if you increase your credit limit by $100, you’ll be charged $10. Even for a card available to those with lower credit scores, the Total Visa has a high APR. Every cardholder will be charged 34.99 percent. If you expect to have to carry a balance at all while using this card, it is probably not the best choice for you. Other unsecured cards such as the Credit One Bank® Visa® Credit Card and Capital One® QuicksilverOne® offer lower APRs. In addition to the high annual fee, the Total Visa Unsecured credit card charges users a slew of fees that make the card expensive to own. In the first year, the annual fee is a $75, and cardholders will have to pay a one-time fee of $89 to activate the card. Every year after that, the annual fee is reduced to $48, but users are charged an additional $75 a year in service fees. If you need to add any cards for authorized users, this is probably not the best option for you. Each extra card will cost you $29 a year. Plus, anytime you have to pay interest, you’ll be charged a minimum of $.50. This might not seem like much, but a few cents a month can make a substantial difference over time. With no rewards program to offset high costs, the Total Visa Unsecured is an expensive card to own. Before deciding if this is the card for you, consider just how much you are able and willing to pay to improve your credit score. 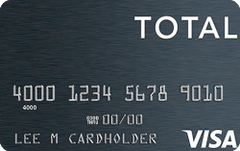 The Total Visa Unsecured credit card is pretty bare bones and doesn’t include any sort of rewards program. You won’t enjoy many other perks, like account alerts or additional insurances. The Total Visa also doesn’t allow foreign transactions and you won’t be able to use the card at all while traveling abroad. If any of these benefits are important to you, consider options such as the Discover it® Secured. You’ll have to pay a security deposit, but the fees are much lower and you’ll earn cash back rewards. Why get the Total Visa Unsecured? You have bad to fair credit and want a quick application process. You don’t want to put down a security deposit. Make your payments on time to avoid high interest charges. Avoid adding authorized users or taking out cash advances to limit fees.